I’ve always believed that it’s in the midst of the biggest crisis or darkest hour that our true inner strength and character shines through. Therefore, is it any wonder that those facing the most difficult circumstances often inspire us by the life lessons they share? For instance, there is a lady in our church that has battled cancer for nine years. Each time the cancer comes back, it spreads more and becomes even more aggressive. However, as I talk to her, I do nothing but learn. Learn about courage, determination, responsibility, gratitude and faith. Great life lessons. Recently I read a book by a Randy Pausch, who eventually lost his life to pancreatic cancer. Though loaded with life lessons, it also had lessons that apply well to business – or at least my business philosophy – and I thought I’d share them here. “Fundamentals – You’ve got to get the fundamentals down otherwise the fancy stuff is not going to work.” Isn’t that the truth? If you don’t have your target market identified or if the message isn’t strong, the fanciest headline or design won’t mean anything. “When you are screwing up and nobody says anything to you, that means they’ve given up on you.” My translation: Constructive criticism is always good. It means someone sees value in you and the work you do. It is meant to make great people even better. So embrace it. Seek it out, and don’t ever take offense to it. “Never believe the no win scenario.” The world is quick to tell us that it can’t be done. That something is impossible. I’m a big believer that anything is possible with enough determination and chutzpa! So whether you’re taking a leap of faith like I did to start a new company is a down economy, or tackling a large project you have little or no training to handle, put in 100% effort, keep a positive attitude and don’t ever give up. “Know what you don’t know, admit it and don’t leave or quit asking until you do.” Boy has this come in handy in this industry. Though I’ve been around equipment my entire life, it was farm equipment. I knew very little about asphalt plants, concrete dowel drills, hydraulic breakers and a myriad of other equipment with which I’ve worked. But it’s this principle that saved me. I was never afraid to admit what I didn’t know and continued to ask question after to question – sometimes even challenging the answer – until I understood. No matter what the topic or industry, this tip is critical to success. “Brick walls are there to give us a chance to show how badly we want something.” Personally, I don’t believe any obstacle is insurmountable, but it is true that obstacles will separate the men from the boys so to speak. It’s the person with real passion and tenacity – a true professional embracing their role as a career rather than a “job” – that will find a way over, around, under or through any obstacle. Those are the people I seek in my company and the folks most of us want on our team. “Experience is what you get when you didn’t get what you wanted.” Okay, I admit, this ones confusing at first. Read it again. Basically, this takes us back to learning from our mistakes right. Each project, assignment, community involvement or new position offers an opportunity for experience. Sometimes it turns out exactly how we expected. Other times it’s not at all what we envisioned. That doesn’t mean the project failed. It may be a wonderful success but in a different way than we planned. Either way, it’s been a wonderful opportunity to learn. 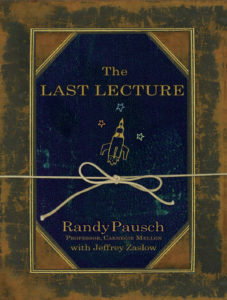 Pausch’s book The Last Lecture is filled with other life lessons as well, and I certainly recommend reading it. But I felt these lessons resonate well for any businessperson. That’s enough philosophy from me for one day. Tell me what you think. Do you have any life/business tips that guide or direct your management or work style? Any great business books you’ve read lately? How about one of these tips that you can personally identify with? Share you thoughts. We’d love to hear from you. « Items May Shift in Flight – Is it Better to Check or Carry-On?